Janos Orsos tells of his life and struggles as a European Dalit. I am a gypsy. I was born and brought up in Hungary, but I do not consider myself a Hungarian - I am a gypsy. Let me explain what that means. Many people think that gypsies are nomadic, but the great majority of gypsies in Eastern Europe are settled. They live mainly in villages, but right on the edge, in segregated streets. Hungary is a western country, viewed from the third world, but the gypsies here live like people in the third world. They live in streets or neighbourhoods where there is no tap water, no street lighting, no sewage - but if you go just a few metres away to the non-gypsy streets next to them you will find all these facilities. In the western world people speak a lot about poverty in India or poverty in the third world, but they don’t notice that the third world is next door to them. I went to India twice and I saw the situation of ‘untouchables’ in India and I can say that our social position in East Europe is exactly the same - not better, not worse. From the gypsy point of view, Hungarian democracy is not really democracy because our segregation means that we have no voice. That is why I call myself a gypsy and not a Hungarian - when I say Hungarian after this I mean the non-gypsy citizens of this country. In Hungary, gypsies are said to be about 7% of the population: maybe 700,000 out of ten million. What people will say a gypsy is depends on who is speaking. The word ‘gypsy’ in my language (which is Bayash, a form of Romanian spoken by about 20% of gypsies in Hungary) simply means ‘man’, ‘human being’. For me ‘gypsy’ means my family, my neighbourhood, my people. I remember the gypsy street where I was brought up with very good feelings. I spent my first 26 years in a very, very poor gypsy street, maybe one of the poorest in Hungary, but it felt good to live there. Nonetheless, outside our own neighbourhoods, to be a gypsy in Hungary means humiliation. It means fighting to live up to the expectations of society, struggling two or three times harder than Hungarian people. In schools we must work three times as hard as Hungarian people - but in the end we cannot get proper education or work. The educational system is not for us, it is not a service made or organised for us, books are not for us. The jobs intended for poor people are effectively reserved for gypsies. People can tell I’m a gypsy just by looking at me, because I am darker skinned than other people. Gypsies are not white. When I go out in public, people look at me, stare at me. When I take a bus or go on the metro, I always have space around me. I feel very uncomfortable because people don’t want to come near me. I’m a Hungarian citizen but everyone can see the difference between a Hungarian face and my face. I am a citizen of Hungary, but in India people think that I am Indian. It is difficult for me in India because people address me in Marathi. When they see I don’t understand, they address me in Hindi. When they realise I don’t understand that, they ask me in English what language I normally speak. They don’t know where Hungary is and so I tell them I am European. In a crowded railway carriage people look from the other side of the carriage and ask me if it is bad for me to travel with them in this compartment because I am European! That is very ironic for me. When we go to Western Europe we don’t have this feeling of discrimination. I have been twice to England and to France and Belgium - everyone in those countries thinks that I am Indian. It is not very socially prestigious, I know, but much more so than being gypsy in Hungary. In Central Europe everyone knows I am gypsy. 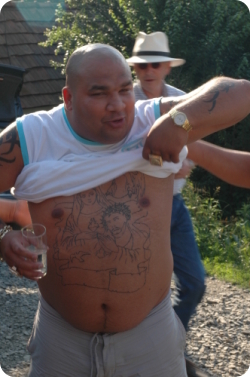 What do Hungarian people think about gypsies? For a Hungarian, ‘gypsy’ means stealing, telling lies, cheating, smelling, being dirty. That is why people don’t approach me in a crowded metro. That is why I can’t have a proper job - because I steal. We can’t learn properly, they think, because we have less mental capacity than white people. There are scientific papers that try to prove that gypsies are different from ‘normal’ people. The fact that they steal and tell lies is genetic and they brought it from India. If you go to bookshops here in Hungary you can find many ’scientific’ books about the genetic inferiority of gypsies still published today. I say that we cannot get proper education. Hungarian people assert that we have the same right to proper education as they have. They are correct, we have that right. However, it is only a right in theory, not a reality. For a start, 25% of gypsy child are considered mentally subnormal. Among Hungarians it is only 2%. If you visit any special school for mentally handicapped children in Hungary you will usually find that all the students are gypsies. The World Health Organisation reports that worldwide on average no more than 3% of the population is mentally handicapped. Yet in our gypsy ethnic group it is 25%. People accept the findings of modern science in every area of modern life - why is it that they accept such crazy pseudo-science? There are economic reasons behind these statistics. The state provides double funding to schools for mentally handicapped children, so the more there are, the better financed the school will be. It is very easy then for the school to segregate the gypsy children. They are usually taught in a separate part of the school, in smaller, less well-maintained classrooms. They eat separately. They have a different timetable of classes and breaks in the day to avoid them mixing with the Hungarians. Not only those considered handicapped are segregated. Gypsy children are segregated in the majority of Hungarian schools, whether mentally handicapped or not. So there are three sets of classes: normal, gypsy normal, mentally handicapped, which means mainly gypsies. Class A is for Hungarians, with normal text books and curriculum, Class B has the same text books and curriculum and is for normal gypsies, Class C is for the subnormal with a special curriculum and text books and it is mainly for gypsies. So what happens to the extra money given to the schools by the state for the mentally handicapped children? You can easily see how the money is spent - it is spent on the Hungarians. They have better buildings and equipment. 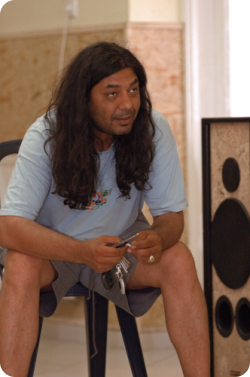 With the extra money given effectively for gypsies, since they make up the overwhelming majority of the mentally handicapped, they renovate buildings for Hungarian pupils and they invest in IT equipment, language training etc. Gypsies, whether mentally handicapped or not, never see any of this money spent on them. These economic facts are reflected in the results. In Hungary, 70% of all youngsters pass secondary school leaving exams, which are important for going on to higher education. Amongst gypsy youngsters the figure is between 5 or 7%, depending on whether we look at the countryside or the towns. And this is a big improvement: ten or twenty years ago it was just 1%. However, I am not sure that these more recent statistics are correct. I work in a number of villages and towns where gypsies are very numerous. In none of these is the percentage more than one - and in one or two cases there is not a single gypsy with a secondary school leaving certificate out of a gypsy population of one thousand or so. These are the figures I have seen for myself. Perhaps in bigger cities these percentages are higher, but in my work in the smaller towns and villages in the countryside this is what I have seen. But if you go to the next villages where there are no gypsies, there around 50% have leaving certificates. That is why I say we do not have proper education. The extra money comes for our gypsy handicapped children but it is used for the Hungarians. It is a very effective bridle for our spirits. It is like the colonial system before the independence of India - but within one country. We are a colony for them just as India was for the British. The difference is that the British went home in 1947, but here the colonial system is in full flower. There are several professions for keeping the colonies going - civil servants, teachers, policemen, lawyers. They profit from our misery. If we want to leave that misery, we find many obstacles placed in our way. If we want to help ourselves, we are suppressed. Of course, they let some of us succeed a little bit - they need that so they can proudly show they have lifted some of us up. When Hungarians do work among us, they are often not trying to provide careers for us, but for themselves - their careers are lifting up the gypsies. Gypsies mostly end up in vocational schools where they are usually trained in trades that don’t really have a place on the labour market, trades that are not really good for earning money - like making flower bouquets, which is a trade not much in demand, fruit harvesting, which is seasonal, and park attendants, when there are no parks in small villages where many gypsies live - this is what they learn at vocational schools. Maybe one in a thousand gypsies has been to a good school or university. Such people mostly go to big cities. They have work - maybe not very worthy, but work. They are the Public Relations side of colonialism. Hungarians can show them and demonstrate that gypsies can go up in society. There are gypsy youngsters who work usefully for the whole of society - but not many of them. As far as I know there is only one gypsy doctor and three gypsy lawyers in the whole of Hungary. There are some teachers, maybe 100 altogether, but they mostly only teach gypsy children. The early part of my own story is a typical one. I was born in a very poor gypsy street. When I was six years old I did not speak Hungarian at all, since the gypsies in my village spoke a form of Romanian. I had to learn Hungarian at school, with the help of my brothers and sisters. I had no real chance to continue my studies. I was not in a gypsy class - in my class there were only two other gypsies. That was very good for me because I was forced to compete with my classmates: I had to work three times as hard as them. But, however hard I tried, I always got very bad marks. I took great pride in writing beautifully, for instance - but still I always got bad marks. The teachers would deliberately give me wrong marks - but not so bad that I would have to repeat a year’s study, because that would mean having a gypsy around in the school a year longer. My knowledge was equal to my classmates’ at that time - but my marks were always lower. Even my classmates protested to the teachers about this, because I had proved that I knew what they knew. But the teachers said that there was no point in teaching me because I would never continue my studies at the secondary level – for gypsies never do! ‘Primary school is enough for you’, they told me. In the end I agreed with my teachers that I should leave school, even though I had not completed the obligatory eight classes. Four days after leaving, at the age of 15, I started work in a factory. I worked 12 hours a day, sometimes 15. I was one of the best workers in the factory, which produced kitchen pots. With the money I earned I was able to help my family. I have seven brothers and sisters and, with my mother, the nine of us lived in a house just 27 metres square. When I began work, my little brother was studying in the same school as I had gone to, but he was getting better marks than me. I thought that we should help him go further in education. I did illegal extra work in the factory, so I could give as much money as possible to my family, especially to care for him. At the age of 17, I managed to build us a house of 29 square metres in the same street as I was brought up in. My brother came to live with me in the new house so that he could have good conditions for his study. I began to learn to drive, which would give me good prospects in the future. So everything was going very well for me and I was helping my family. Other people appreciated me very much for what I had achieved. But in 1993 I was kicked out of the factory and became unemployed. When the communist regime ended, unemployment began. Under communism there was no unemployment: that came in with the market economy. For the outside world the information was given out that it was the less educated who were the first to be unemployed - but really it was the gypsies. It is well known that in these factories there were non-gypsy workers who also only had primary education, like me, but they were kept on, while the gypsies were fired. It was a euphemism to say that it was the less educated, really it was the gypsies. My new house had its roof but it didn’t have windows yet. I now had no money to finish it and it took me two more years. I had only one exam to go before getting my driving licence, but without money I could not complete it. It was a big collapse. I was 18 at that time. After leaving the factory, I spent one year in military service, which all young men had to do in Hungary at that time. I liked the military - I was important to someone, I was serving my country, I had a uniform, I had food. And there was no discrimination. The day I joined, the senior officer told the 600 recruits who joined with me that there was to be no discrimination: we were all equal, all serving our country together. But, after one year, my service was completed and I was unemployed again at the age of 20. My career was over, I couldn’t achieve my dreams. I began to drink. I was not a real alcoholic, but I drank systematically. After one year I was scared of what I was doing to myself and I remembered that at the age of ten I went regularly to church. I began to read the bible and go to church. I stopped drinking and began to live again. The priest of the village found my sister and I a course for unemployed young people that trained them to become social work assistants within the Catholic Church. I was 22 years old and I began to study and it went well. This was a very good period of my life. Around this time I came in contact for the first time with gypsies with school leaving certificates and this made me think that I could get one too. At the age of 23, I decided to begin secondary school along with my sister. I did very, very well at this school. My younger brother was 14 and studying in the last year of elementary school. When his teachers discovered that he wanted to go to secondary school, they began to give him very bad marks. But nonetheless he managed to get to secondary school. We were behind him, supporting him financially and in other ways. So that was the beginning of my involvement with the movement of helping gypsy youngsters to continue their studies and I have spent the last twelve years in that movement. To begin with our work was done within the Catholic Church, but we drew on other sources as well. George Soros, a billionaire American of Hungarian origin, financed our movement. 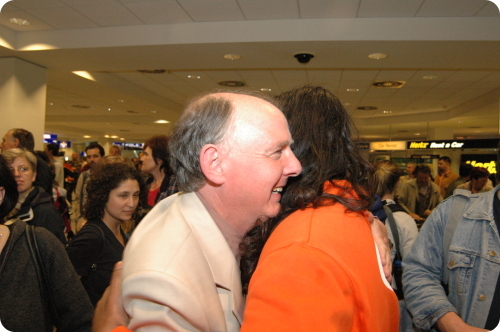 I coordinated scholarships through his foundation for hundreds of gypsy youngsters. 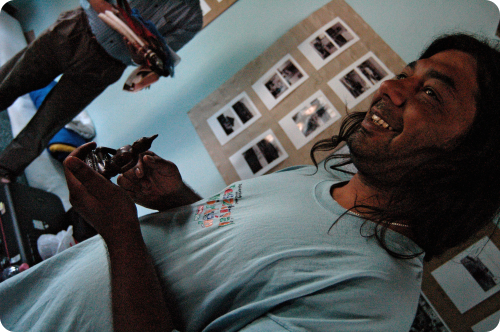 And he helped us set up Amrita Community House, which was the centre of this movement. 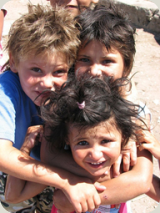 Amrita is an organisation that helps gypsy youngsters with their further education. It is based in the city of Pecs, and has students in every town of South West Hungary. The programme worked very well, providing scholarships for young gypsies and supporting them in their studies: for instance, we organised summer camps for hundreds of young people, all of whom had scholarships from Amrita, as I did myself. We called the organisation ‘Amrita’ for very specific and important reasons, continuing the trend already begun when we gave the name ‘Gandhi High School’ to a secondary school for young gypsies we had founded in Pecs, also with the help of George Soros. We wanted to emphasise our connection with the East and its culture. We wanted to show non-gypsy Europeans that there are cultures outside Europe - older cultures and ones that are no less prestigious. We gypsies don’t really have anything to do with Hungarian culture - we are not included in it. So we couldn’t imagine calling our organisations after famous Hungarians who we have had nothing to do with and don’t know much about. Through these names, ‘Amrita’ and ‘Gandhi’, we could build and strengthen our identity. We had begun our work within the Catholic Church but we did not continue within it. We were put off partly by the way that people in the Church saw us. The Hungarian old ladies in the Church thought that we gypsies could not believe in God as much as they could. But mainly it was the narrow attitudes we encountered from the Catholic authorities themselves. For instance, before we went to a summer camp one time, we went to Caritas, the Catholic charity, to get some shoes - shoes being a problem in poor gypsy families, whose members often couldn’t come to the camps for lack of footwear. The old priest who looked after the store was very kind to us and promised to find something for us. He came back with a sack full of soap - so that we could have baths, it being a standard stereotype that gypsies are dirty and smelly. I just threw it away. Another incident finished our relationship with the Catholic Church. At the summer camps we gave out tee-shirts with ‘Soros Foundation’ printed on them. When Aniko, my sister, went in to work at the church in the village wearing one of these, the local priest, who we liked and who had been very helpful to us, especially in finding us the social-work course, asked Aniko not to wear it. She asked, ‘Why not?’ He said, ‘Because Soros is Jewish!’ She asked, ‘Why is that a problem?’ He replied, ‘Because we are Catholics’. She said, ‘Wasn’t Jesus a Jew?’ ‘Yes,’ he responded, ‘but he converted!’ That was the end of our connection with the Catholic Church! 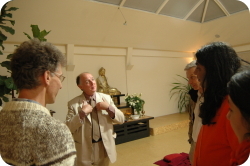 When I finished my studies at the high school, I began to study at the Buddhist College in Budapest. The peculiar circumstances in Hungary after the end of the communist regime enabled many Buddhist groups to participate together in establishing an official ‘church’ and then to set up a University, the Dharma Gate College, in Budapest, which has degree level courses in a number of academic subjects related to Buddhism. 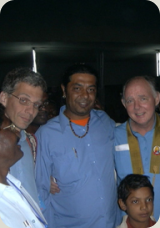 A member of the church, Tibor Derdak, was very involved in our educational work in the South West. He had been a Liberal Party MP in the first post-communist parliament and had played an important part in establishing many rights and opportunities for gypsies. Through him we were linked to the Buddhist Church and College. 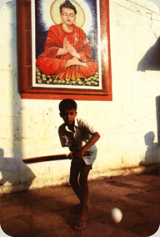 In 1992, when we founded the Gandhi High School, the Church was one of the organisations that gave us their backing - although all the funding came from other sources. So from then on we had a continuing relationship with them and I began to study at the College. Even though I had stopped working with the Catholic Church, I still considered myself a Catholic - indeed, what I saw of Buddhism in the College strengthened my Catholicism! If anyone asked me where I studied it was strange for me to say it was at the Buddhist College. There are brilliant scholars at the College, but this is academic or intellectual Buddhism and it is not for me. I certainly never thought of becoming a Buddhist at that time. After some four years, in 2004, we made a connection with the FWBO. This came about through one of my teachers at the College - not only Catholic priests have been our patrons! 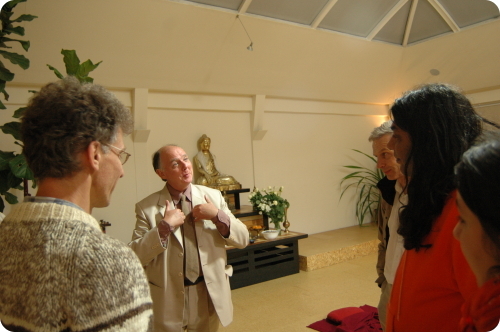 He visited one of the main centres of the FWBO in England and spoke about Buddhism in Hungary with some of their leaders. They found our email address in the journal of the Church and College and wrote to us. My English was not that good at that time and when I saw these emails I thought that they were spam and I deleted all of them. Fortunately, Tibor answered for us and in that way we came to build our connection with them. Members of the Western Buddhist Order came out to Hungary to meet us. I thought that they were just intellectual Buddhists like the others I had met in Hungary. But Subhuti told us about the work of the FWBO/TBMSG in India and showed us a film about it. I saw their many educational institutions for Dalit people and I recognised that there was a very strong parallel with what we are doing in Hungary among gypsies. I had a strong desire to see this work for myself - but I was aware that I could only see it by going to India. I had always wanted to get to India. In my childhood I had seen the film, ‘The Jungle Book’, with Mowgli and the animals in it, and other nature films. And then of course everyone thinks that gypsies are originally from India. So going to India was a dream for me. 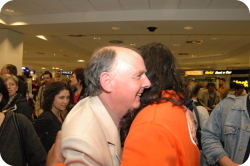 The Karuna Trust paid for my air ticket and, at the end of 2005, I visited for one month, with my friend, Tibor Derdak. The first sight I saw in India was not the exotic beauty I had seen on TV. I was very deeply struck by the poverty and the conditions my new Dalit friends had to live in. In Bombay, on the first night, we slept on the ground in a tiny flat in the slums, in what seemed to be a kitchen. We were taken then to the Bhaja retreat centre, near Pune. The centre is on the edge of the jungle and I felt quite scared. But when we got there it was so beautiful. From then on it has been my favourite place in the whole world. I visited educational institutions in a number of cities in Maharashtra: Aurangabad, Amaravati, Pune, and Nagpur. Everywhere I saw gypsies! To me the Dalits are gypsies and the gypsies are Dalits. What struck me most strongly was that the Dalit people run these institutions themselves, not white people. They believe very strongly in their work and we saw with our own eyes that many people have improved their lives in a real way through that work. The Dalits we were meeting were very proud to say that they were Buddhists. But their way of practising Buddhism was quite different from what I had seen in Hungary - even the way they practised meditation was different. I realised that this whole movement is based on Buddhism. I felt strongly that I can identify myself with this movement. It had a very big impact on me. I saw people like me take their destiny into their own hands through Buddhism and that is what I wanted to do and wanted other young gypsies to do. After one month in India, I came back convinced that I was a Buddhist. On a very big retreat in Nagpur for 5,000 people, in January 2006, I had become a Dhammamitra, publicly declaring that the Buddha is my teacher, that I will practise the five precepts, and that TBMSG/FWBO is my spiritual family. But back here in Hungary, there were only Hungarian Buddhists, and I could not identify with them. However, people from the Western Buddhist Order/Trailokya Bauddha Mahasangha, both Europeans and Indians, came to stay with us and they were completely different from the Hungarian Buddhists. It took me some time to work out what kind of a movement the FWBO in Europe is, because these were white intellectual people who took to Buddhism for reasons that I could not really understand. But they were different from the Hungarian Buddhists I had met, because they were genuinely concerned with social questions. When they come to Hungary they spend time with us, which Hungarian Buddhists don’t do. They have become our friends and the connection between us is very good. However, I feel that I am much more closely identified with Indian Buddhism. That is why our own new and independent religious organisation wears the name of ‘Jai Bhim’. The name gives a message: it means that we belong to India. We have found a new framework for our twenty-year-old movement for gypsy education. We began to believe that we too can take our movement in our own hands and run it ourselves, just as our Indian brothers and sisters do. 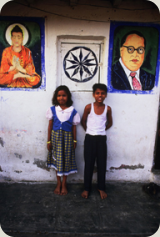 Our experiences over the last twenty years fit well with the Ambedkarite movement. Our Indian friends started fifty years ago and they have big results. So we feel it is worth us starting out on the same path. We have found that Dr Ambedkar’s thinking fits well with our aims, so we have named our new school, ‘Dr Ambedkar High School’. I feel very pleased that I can speak in Europe about Dr Ambedkar. Nobody in Europe has heard for him, so it is one of our major tasks to speak about him. It is very wonderful for me to see that my actions find parallels in Dr Ambedkar’s activity and movement. We have found ourselves going through the same steps as our Indian friends, because these are the logical steps in our social situation. Our Indian Buddhist friends are able to take their own institutions in their own hands because they have their own hero. 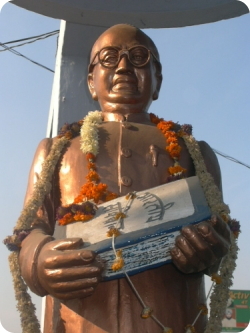 When I see all the photos, statues, and other images of Dr Ambedkar in India, I feel a bit uneasy, because in Hungary, when it was still under communist rule, we had images of leaders everywhere - it is what we call the cult of personality. However, I understand why Dr Ambedkar is remembered in this way. For us too Dr Ambedkar is vitally important. This is the only way that we can send the message to society that we exist. We don’t want a cult of personality in our movement around living gypsy leaders. But I want Hungarian society to take us seriously and respect us as human beings. I want to see gypsy youngsters getting good results in their education and going on to take up important positions in society. And it is very easy to speak about a personal story like Dr Ambedkar’s, because he himself achieved what I want many young gypsies to achieve. So Dr Ambedkar is a very important symbol for us – a very important message to ourselves and to others. We need the image of Dr Ambedkar because we are still invisible to society. For instance, my white colleagues are not as good at teaching our gypsy students as I am, for obvious reasons. But it is always the white people who are known about. For instance, it is well known in Hungary that the Buddhist Church is active in the gypsy field, especially at the Little Tiger High School in Alsosantmarton, in Southern Hungary. But whenever the school is talked about in the mAlsoszentmartonedia nobody notices the gypsy activists who work there without money, even though these activists get excellent educational results, usually better than the white teachers. But we are not noticed. The white Buddhist authorities are highly visible because they ’sacrificed their lives’ going to the gypsies - the biggest sacrifice that one can make! They become famous as heroes and saviours - but we are nowhere. And this is the story of Dr Ambedkar. In Europe people have heard about the untouchables and how Gandhi almost sacrificed his life for them - everyone knows this in Europe. I have nothing against Gandhi, I respect him. He is a real hero for India. But what did Dr Ambedkar do? Wasn’t he a participant in this movement? Nobody knows about him because he is the gypsy. This is a very easy parallel for me to make. So taking Dr Ambedkar’s thought as our basis and using his image as our rallying point, we have set up a new organisation, ‘The Jai Bhim Religious Network’. If we want to create schools for gypsies in this situation, where we have no real connection with the culture and thought of the surrounding society, we need a new context of ideas and culture that relates to us. We need to be able to define ourselves - not for other people, but for ourselves. We are very happy to be members of FWBO. But we are not Western Buddhists - we have never been welcomed into Western society and it does not belong to us. Our social situation is not equal to that of Western members of the Order; it is very similar to what we saw in India among Dalits. So that gives us a feeling of solidarity with them and we identify ourselves with them. We certainly want to use the knowledge found in the West. There are Western Order members who are our friends - indeed, anyone who is willing to work with us is our friend. But our strongest identification is with the Ambedkarite movement in India. That is why we have named our organisation ‘Jai Bhim’. It is a message of self-definition to ourselves, which helps us to be clear what we want. It gives us our ideological background - our background of vision and ideas, which we need in order to carry out our task. 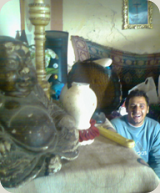 That task is running social and educational institutions for gypsies - and for us this is Buddhism. We don’t judge ourselves by how much time we spend meditating. For us our educational work is effective when people become aware of their own minds. Our goal is to help people to be aware of the potential within their minds. We help them to grow out of their ghetto world, within a Buddhist framework. Through us the students can meet Buddhism. These youngsters will easily identify themselves with the ideas and the vision that helps them. It may not be that every member of our schools or our movement will take to Buddhism, and they certainly won’t to begin with. This was the case for me too. 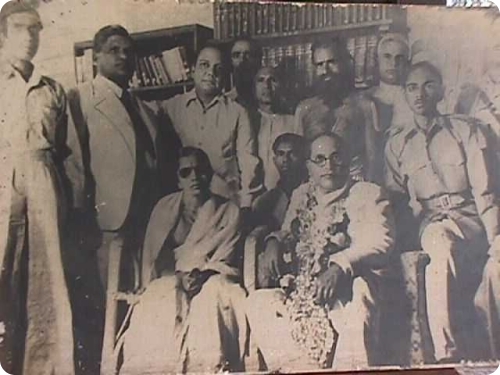 What was interesting for me when I first came across the followers of Dr Ambedkar in India was not Buddhism but the social movement. I connected first with that movement and the people in it. No doubt it will be like that for others too. The Jai Bhim Religious Network is an ecclesiastical organisation, legally speaking. We have founded a church! Of course it’s not usual to found a church and this particular church has no precedent in Hungary. There are new Christian groups forming new churches in Hungary in a Protestant context, but these Christian churches belong to sects that operate outside Hungary. Ours however, is a Buddhist church. We have done that, firstly, because of our Buddhist convictions. Second we have founded a Buddhist church because the Christian groups and churches ignored and neglected the education of poor people. They do deal with poverty, at least if it concerns old people or ill people - but if it is about gypsy families it is not important to them. We have founded an autonomous church, which is not under any other denomination or ideology, although it is linked to TBMSG/FWBO. This is the first church in Hungary set up by gypsies for gypsies. There are Pentecostal gypsy churches, but they are just segregated versions of the Hungarian churches and the leadership and organisers are all Hungarians. The gypsies need the authorisation of the Hungarians to organise anything. But this church is ours. There is only one non-gypsy in our organisation. We, the Dhammamitras who run the Network, decided that we would be very cautious about letting in non-gypsies, because of our experience of being taken over or co-opted in the past. Non-gypsies can come to work with us - we will pay for their work, for instance as teachers or administrators. But we don’t need them to tell us what is good for us. We have had enough of Hungarians telling us what is good for us. I worked for the Catholic Church and I was not Catholic enough. I worked for the Dharma-Gate Buddhist Church and I was not Buddhist enough. I do not want anyone to tell me I am not good enough. So often our efforts are appropriated by Hungarians. For instance, we helped the Catholic Church to set up a gypsy hostel in Manfa, near Pecs. All the money which was needed to buy the land and develop the buildings came for gypsies from government grants and donations from NGOs. Our smiling faces were on the appeal leaflets, and I did the work of getting those grants and donations. Then the buildings were built and it was time to hire staff and open the hostel - they didn’t need me or other gypsies any more. They had got the property in their own name and had the income for their own people. The same thing happened at the Little Tiger High School in Alsosantmarton, this time with the Buddhist church. I did the work; we raised so much money - not a penny of it from the Buddhist Church itself. We did the initial very hard work of setting the school going and in two years young gypsies succeeded in getting their school leaving exams - not the four years it usually takes. Then they took it away from me and my gypsy friends and made some other trouble for us. So we don’t need owners like that. We want to be fully responsible ourselves. Some things will go wrong, of course - but it will be my own fault, my own responsibility. In the past we have built schools and other institutions for gypsies which Hungarians have controlled. Now we are in control and we intend to stay in control. With the Dr Ambedkar High School we are trying to do the impossible. We are trying to provide education for youngsters who are totally outside the secondary educational system. When they come here at the age of 16 or older, they often cannot read and write properly. They come from very difficult circumstances. They don’t have proper housing; sometimes they don’t even have shoes. So we work with people in deep misery. We began this work without any money. What we have achieved is just with our own effort. The teaching we do is not something special. Gypsy students have the same kind of brains as members of other ethnic groups. But because of the way the educational system works in Hungary, most of them know virtually nothing - most of them cannot read or write or calculate. Some of them have been declared mentally handicapped on the basis of their social situation. Those who were considered normal were usually in segregated classes for gypsies with very inadequate teaching. Even those in normal unsegregated classes could not learn because the teachers made no effort to understand them or to appreciate the situation from which they came. Many of them left school after just five or six years - not the normal eight. Meanwhile, the Hungarian children, the control group, generally get a good education. They are taught IT, foreign languages, how to communicate - but these are not on the curriculum for most gypsy children. The gypsy children are taught by teachers who are not properly trained, with educational programmes that are very dated. What they are taught, even at best, doesn’t touch them because it isn’t aimed at them. It is education designed for the middle classes given to students from the under-class - it has nothing to do with them. In the teacher training colleges, there is no attempt to train teachers to deal with this problem, which affect 8% of the population. So what are we doing about this problem? From September 2007, we are concentrating on an area in Borsod County in Northern Hungary, where gypsies live in terrible conditions. About 90% of gypsies in this area have no regular employment and have no prospects. We rent buildings in various villages where we hold our classes, since our network does not have its own building yet. These are school buildings belonging to the local authorities in peasant towns and villages, but, since the birth-rate for non-gypsies is dropping very rapidly and many young couples move away, there are no children. So the authorities need to find students from somewhere, even from gypsies, since they must be used for educational purposes. So we have schools, but we don’t have a building to live in ourselves yet - we have to camp in the classrooms! But our work is developing well. We will have our own buildings one day. 120 students registered for admission when we started, but many of them don’t come. They want to study, but their lives are not organised so that it is possible at the moment. For instance, some young girls get pregnant and many young men have to earn money for their families through casual labour or seasonal work in other parts of the country. So, not everyone who wants to learn in our school can do so. But there are 60 who do come regularly because they are able to fit study into their lives. And more will come in time. We have just completed our first term. We have to meet the students each morning with our minibus at a bus stop some distance away, where the school bus throws them out because the bus company does not believe it is a real school and will not bring them to the door. When they arrive we give them something to eat here, because some will not have had proper food at home. Then we start the classes, trying to give everyone what they need to begin again what they left unfinished some years ago at some school somewhere. We are concentrating on teaching them the skills of reading, writing, calculating, and communicating. Some of them already have some competence in these skills, some are complete beginners. What do we do that is different? The first step is making them believe that they can accomplish a normal secondary education. We help them to believe that there is an alternative to lifelong unemployment and lack of prospects in life. Slowly but surely we have to fight the resistance within them to school - because they have developed a resistance due to their previous experience. They are alienated from school, from knowledge, from books. We have to make school sympathetic to them. Only after that has been achieved can we teach them reading and writing and calculating. Once they can read and write and calculate, we can give them the knowledge about the modern world that is required at university and college. Not all of them will go to college, but they still need a certain level of knowledge of the modern world if they are to get out of their ghettos. They need to be able to choose between university and the world of jobs. We consider that what we are doing is creating possibilities for them - this is the slogan of the Waldorf educational movement, which we have made our own. There are many people who are deeply critical of us, even who hate us; there are many people who revere us; and there are many people who are jealous of us. People ask, ‘Are these gypsies real Buddhists? How can you teach Buddhism to gypsies?’ What we are doing is so strange in Europe, where Buddhism is largely the leisure hobby of the middle classes. People say, ‘Isn’t Buddhism a luxury for gypsies in villages?’ Some of these comments come from Christians - but it is easy for us to answer them: they don’t offer effective secondary education for gypsies and we do! But whatever people say, it doesn’t bother us - we just carry on with our work. And we know we are not alone! To my Indian brothers and sisters I say: let us do it together! Before I say anything let me introduce myself. I am Ganesh from India, from Nagpur, the same city where Dr. Babaseheb Ambekar ebmraced Buddhism. I did read your complete post yet, but I have taken a printout of it and will read it at home (as I am doing this from a payed net cafe). I have read about your movement in some magazines and some on net. We never knew that the European who call themselves so well-cultured treat their own men like they were not human beings. True path is the path of Dhamma, the path of Babasaheb. I hope, nay, I am sure it will lead you to a bright future. We shall overcome, we shall overcome, we shall overcome some day. Once again, Jai Bhim! doing for ur people. i wish u best luck. it’s great seeing Dr. Ambedkar’s follower in Hungary. The Emancipator, The god of Small. What Millions of god and goddess of Hindu’s could not do, Dr. Ambedkar alone changed the the life of millions of untouchables in india.